The Back Creek Friends Church or Meetinghouse has gone through many changes, but the 1899 structure remains the oldest religious institution meeting under its original name on its original site in Grant County. Moving out of its original meeting cabin and into a brick structure in the early 1800’s, the church later outgrew this facility and built an even larger space. With the help of key settlers, and the passion of early ministers, the growth of the Back Creek Friends Church appeared to be inevitable. In most recent years, renovations to the original 1899 building and a new annex have kept the church up to date. The Back Creek Friends Church was founded by the Society of Friends who migrated from the Carolinas, and established the second Meetinghouse in Grant County which included a schoolhouse, cemetery, and horse shed; the services initially were held on every Thursday with a minister leading the service. Members of the Religious Society of Friends migrated from the Carolinas to present day southern Grant County, Indiana, in the late 1820’s where they settled along both sides of a creek (Wan 64). These pioneers left North Carolina and settled in Fairmount Township for two purposes: to escape a slavery-oriented Southern society and to find soil that was richer for farming (Kirkpatrick). Joseph Winslow was the second settler to establish roots in the Fairmount Township and founded the Society of Friends there (Whitson 891). For a brief period of time, the nearby stream was commonly referred to as Winslow Creek, but “Joseph Winslow, who was a plain, unassuming man, protested against the idea of calling this stream after his family for the reason that it appeared to him like exalting his own relatives over others equally entitled to consideration” (Baldwin 49). After deferring to Winslow’s wishes, the early settlers officially named the stream and their new meeting Back Creek, having come from a meeting in North Carolina of the same name with a similar creek behind the Church (Warr 63). The land in Fairmount Township where the Church would be built was donated by Exum Newby and the ground for the cemetery next door was donated by Daniel Winslow, son of Joseph Winslow (Baldwin 49). In 1829, and for the next several years, the worship meetings were held in the log cabin of Joseph Winslow while Exum Newby and carpenter Thomas Hill built the first Friends Meetinghouse at Back Creek. It was at the completion of this first building in 1838 that the Back Creek Monthly Meeting of Friends was formally established (Ellis 13). It is interesting to note that presently one can still identify the foundation of this first brick structure that was built. The church was forty feet by eighty feet and the walls were eighteen inches thick (Ellis 13). Although this substantial building served the meeting well for 60 years, it was eventually torn down and replaced in 1899 with the present Meetinghouse. “The old Back Creek Meetinghouse should never have been torn down, but kept as a lasting monument to the memory of the loyalty and energy of the founder of that church. What a great place that could have been made for recreation and public meetings!” (Baldwin 105). 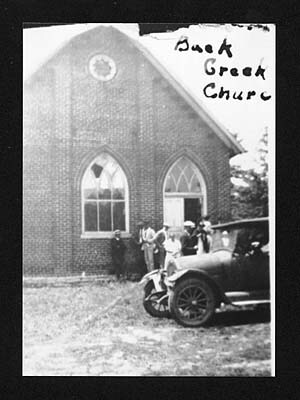 In 1945, Back Creek renovated their existing structure because a car crashed into the porch of the Church (Kirkpatrick). More accurately, Quakers do not consider their meetinghouses “churches” per se; instead Quakers believe the people should be called the church. Kirkpatrick commented that early Quakers called the churches of any denomination “steeple houses,” because churches were basically houses with a steeple on top. As seen in photographs from 1899, the Friends put a steeple on their new building for an unknown reason. However, sometime between 1899 and 1945 the steeple was removed, and never returned (Kirkpatrick). The latest addition, an annex dedicated in 1997, was connected to the side of the 1899 Meetinghouse and contains a study, classrooms, fellowship hail, and rest room area. The property of the Back Creek Friends Church also included a schoolhouse, cemetery (Wan 64) and horse shed (Kirkpatrick). The schoolhouse structure and cemetery still exist today. 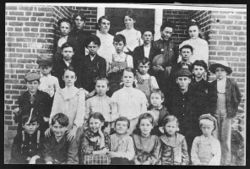 Education was cherished by the early Quaker settlers; schooling often began in a log cabin (Back Creek). It is not known for certain if the school originally met in Winslow’s log cabin, which was also used for worship during the same time, but many sources have supported that idea (Ellis 9; Kirkpatrick; Whitson 891). In 1874, the Quakers experienced a need for larger and better educational facilities, and consequently “built a two-story brick school west of the present parsonage that was used by Friends children” (Weinhardt 1). This facility taught up to the eighth grade (Kirkpatrick). Much of the school’s success can be attributed to a young Quaker teacher named Elwood O. Ellis (Kirkpatrick 2). In 1883 the Fairmount Friends Academy was built for the purposes of supporting secondary education. The Back Creek Friends School helped start this Academy (Kirkpatrick 2). In 1940, the school closed and was sold to an individual who soon after converted the building to a motorcycle repair shop (Kirkpatrick). Of note, James Dean lived in the first farm north of the Back Creek Friends Church and would often walk down and spend time at the motorcycle repair shop (Cabe). James Dean also attended Back Creek Friends for many years (Cabe). Behind the church, there was a horse shed. When the weather was poor, members would keep their horses in the protected facility (Kirkpatrick). The first known burial in the cemetery was Exum Newby’s wife who died in 1829 (Watson 1). There are just over 1000 known burials in the Back Creek cemetery, including one War of 1812 veteran, many Civil War veterans, and one Confederate soldier (Kirkpatrick). In about 1880, Park Cemetery was opened south of the Back Creek Cemetery. 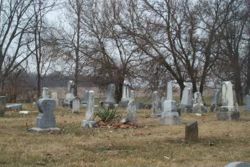 Ralph Kirkpatrick indicated that many families decided to move their buried relatives from Back Creek Cemetery to Park Cemetery, mainly because the later was better maintained. As a side note, Kirkpatrick indicated that often family members simply hired an individual to exhume the remains of their loved one at Back Creek, and transport them to Park Cemetery via wheel barrow for reburial. The Back Creek Friends Church would traditionally have meetings at eleven in the morning on Thursdays, and the church property was also the site of the Quarterly Meeting (Ellis 8). The services of the early years in the church would be silent unless anyone felt moved by God to speak (Kirkpatrick). The Back Creek Friends facility was the site of the June Quarterly meeting, the largest event to come to the church, during the years of 1839 to 1893 (Weinhardt 1). Attendance swelled each year until by 1893 there may have been ten thousand people assembled on the grounds (Weinhardt 1). The membership of the Back Creek Friends Meeting at that time was nearly 440. Currently, thirty-five to forty-five attend a regular service, but the pastor reports on some occasions services can attract up to sixty (Cabe). The early Friends Churches were served by individuals who were called ministers, not pastors. In the last half of the nineteenth century, the Friends Church decided that they should employ pastors. The first pastor of the Back Creek Friends Church was Ruth T. (Elliot) Carey in 1873 (Whitson 1167). Carey accepted the call to ministry when she was just eighteen years old. She preached in the Back Creek Church in Grant County, in the Friends Church at Manton, Michigan, and finally in the Friends Church at North Grove, Indiana (Whitson 1167). She preached on many other occasions as well, and is recorded to be one of the ablest exhorters in the church history. Ruth Elliot was married to Mr. Carey in 1875, at the Back Creek Friends Church (Whitson 1167). The Back Creek Friends Church was the second Friends Church in Grant County (Kirkpatrick). 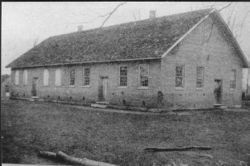 Ralph Kirkpatrick indicates that the first established Friends Church was the Mississinewa Friends Meetinghouse which helped to support the Back Creek Meetinghouse development. 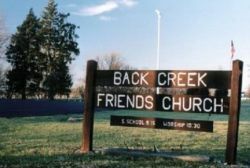 The Back Creek Friends Church in turn was very instrumental in establishing many other meetings in Grant County including Oak Ridge in 1843, Center (Jonesboro) in 1844, Fairmount in 1852, Little Ridge in 1854, and Upland in 1874 (Weinhardt 1). The Back Creek Friends Church is Grant County’s oldest religious institution meeting under its original name on its original site (Weinhardt 1). Although the Mississinewa Friends Meetinghouse was the first in the county, this group supported the growth of Back Creek Friends because the Mississinewa facility was too far for some of the members to travel. After a few years, some members of Back Creek Friends felt that location was also too far to travel, and consequently, other Churches in more convenient locations were established (Kirkpatrick). The Back Creek Friends Church was founded by the Society of Friends who migrated from the Carolinas, and established the second Meetinghouse in Grant County which included a schoolhouse, cemetery, and horse shed; the services initially were held on every Thursday with a minister leading the service. 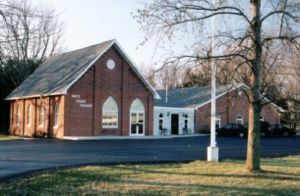 Although some things have changed, such as meeting times, pastor involvement, and improved facilities, many aspects of the early influence of this church remain. It is a testament to the original commitment and the vision of members over the years that this denomination has remained in the church for 174 years. The care taken of this facility is apparent both inside and out; just as important, but less obvious, is the care to preserve the history of the church. This church stands as a reminder that much can be learned from the past while moving to the future. Back Creek Friends Meeting. Church Bulletin. 28 December 2003. Ellis, Ellwood 0. Early Friends in Grant County. Indiana. Ed. Heiss, Willard. Indianapolis: John Woolman Press, 1961. Kirkpatrick, Ralph. “Homecoming, Too: Back Creek Friends Dedicate New Annex.” News-Sun 22 October 1997. Wan, Ann and Harry. Area History Of Fairmount, Indiana. Curtis Media, mc, 1997. Whitson, Rolland L. Centennial History Of Grant County Indiana. Vol. 1. Chicago and New York: The Lewis Publishing Company, 1914. This article was written by Emily Voss and submitted on January 5, 2004 for Mr. Munn's AP US History class at Marion High School. She would like to thank Ralph Kirkpatrick and Pastor Linda Cabe for the generous interview time they spent to meet with her, and for allowing her to record the information they shared. This page was last modified on 26 June 2007, at 09:23.